Wyoming Game and Fish Director Scott Talbott speaks at a Landowner of the Year ceremony. Talbott is retiring after more than 30 years with the department and eight years as the director. 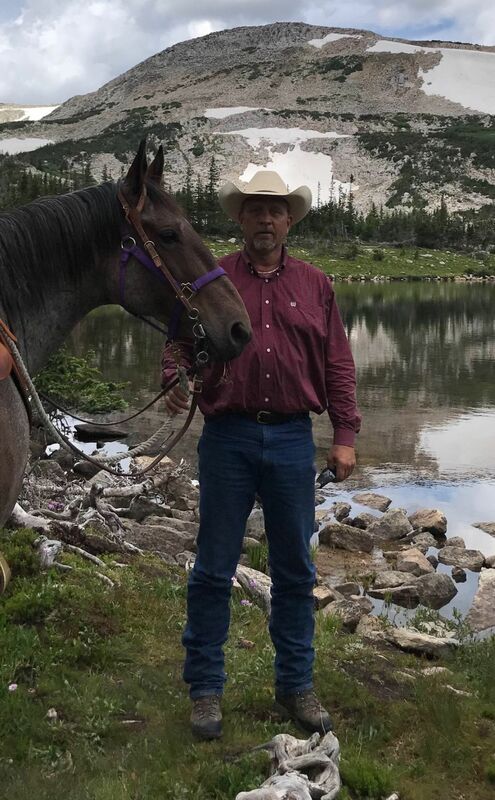 Wyoming Game and Fish Director Scott Talbott poses with his horse in 2017 in the Snowy Range. Wyoming Game and Fish Director Scott Talbott smiles in 2011 next to a dog, Dax, while on a lake on his family's ranch near Laramie. Wyoming Game and Fish Director Scott Talbott turns for a photo while hunting in 2016 in the Wyoming Range. When the historic winter of 2016 began killing countless mule deer in western Wyoming, the Wyoming Game and Fish Department felt pressure from residents to feed the starving creatures. It seemed like a logical stopgap to some, but research has shown artificially feeding deer does not ultimately help struggling herds. Game and Fish Director Scott Talbott talked with the public and followed recommendations of science and did not feed. “As director, Talbott has consistently met with sportsmen and sportswomen to have thorough conversations about access, season setting, wildlife management and on policy topics such as the Greater sage-grouse and migration corridors,” said Joy Bannon, policy director for Wyoming Wildlife Federation. The mule deer example was one of those examples. Talbott, 56, announced at a Game and Fish Commission meeting recently that he was retiring from the Department. His speech brought many in the room, including commissioners, to tears. Born and raised on a ranch outside of Laramie, Talbott started working Game and Fish 34 years ago. He served as a habitat technician, a damage control warden, a game warden, a wildlife investigator and a regional wildlife supervisor, among other jobs. He spent eight years as the assistant division chief of wildlife before becoming the department’s director in 2011, appointed by former Gov. Matt Mead. “Talbott surrounded himself with solid, hard-working employees and when needed, would back them up with his breadth of knowledge regarding their work and would support their direction,” Bannon continued. The Star-Tribune caught up with Talbott as he prepares to leave his post on Monday for a wide-ranging interview covering grizzly bears, funding and the future. CST: Why did you decide to retire? Talbott: There’s a new governor, there is going to be new commissioners. I have 35 years in with the state… It’s time for me to enjoy the things that myself and people in red shirts have worked so hard to provide for the public. CST: What are the biggest issues you faced in your tenure as director? Talbott: Endangered species issues, whether that be grizzly bears or wolves… the trials and tribulations we went through and are still going through to get those under state management were a huge, huge challenge. Obviously what happened with the black-footed ferret and the fact that we moved forward with the reintroduction of the black-footed ferret is an ESA success story, but wolves and grizzly bears are quite challenging. Then I would have to say another one of the huge issues that I took on as director is our funding. Right after I became director, we had to restructure the agency… One of the things I’m most proud of is that we cut $7 million, 23 positions out of the agency, and I asked our folks to step up and do what we had to do to get our work done and we did it. We righted the ship financially. That process made us much more effective and much more efficient, but wow, it was a lot of work and a lot of stress taking over the agency. Another milestone is public credibility. When I became director, I challenged our folks to put a face on the agency, I wanted when someone criticized the Game and Fish department them to know somebody in the agency. If someone had an issue with fisheries, I wanted them to know the fisheries biologist that they worked with. Our credibility was not all that great when I took over as director, and our folks worked really, really hard at that. I want to give them credit for that. CST: Do you think the model of hunters and anglers paying for management should change? Is it sustainable for license fees to pay for management? Talbott: I think we need to broaden that base. Clearly there are programs like aquatic invasive species and the threats of quagga and zebra mussels. While they would not be good for aquatic resources, the threat to water supplies and users are far greater than they are to wildlife users, to fishermen. I think it’s appropriate that for programs like that there is alternative funding. I feel the same way about sensitive species and nongame species. There should be a way for the public to contribute to that. Whether that be private foundations, whether that be general fund grants or other sources. Folks should be able to contribute to the management of those species. That being said, you hear a lot of people talk about the North American model of wildlife management is broken because it’s being paid for by hunters and anglers, and in my conversations with Wyoming hunter and anglers, they’re willing to shoulder the burden. That might not be the case in other states, but the passion and culture of Wyoming people for Wyoming wildlife is remarkable. CST: How did wildlife management in Wyoming change over the course of your career? What did the landscape look like 30-plus years ago versus today? Talbott: With the exception of elk, we have less wildlife now than we had 30 years ago. Those populations of deer and antelope were well over carrying capacity in the ‘80s. We had lots and lots of opportunity and in all honesty there were probably too many. And so we had a series of droughts and hard winters, and a series of checks you may say that have put us back on. Elk continue to do well in Wyoming. They are an incredibly hearty, adaptable animal and they do well. Large carnivores, we didn’t talk about wolves 35 years ago. The bear program was a very small program, very, very minimal conflicts and those two programs have changed significantly through time. The other thing I find very notable is my perception in the change of attitude toward wildlife in that time. Wildlife is, in my opinion, much more valued by the public, by landowners, by hunters now than it was 30 years ago. I think that is supported by a number of things, but our culture of wildlife, the demand for wildlife in Wyoming has increased significantly. If you look at things like doe/fawn whitetail deer hunting and cow/calf elk hunting, the demand for those licenses is at an all-time high. I think that there has been a change in perspective in landowners, more support for wildlife and the public has been more engaged in their wildlife resources. CST: How difficult has it been to manage wildlife in an ever-growing, developing state? Talbott: There’s obviously been very significant challenges. We have to balance the needs of wildlife and the rest of society. That balance… can be very, very difficult from a public perspective because oftentimes the public can be pretty diverse and opinions vary greatly. There’s been some very significant challenges to strike that balance to maintain healthy wildlife populations in herds versus recognizing that other land uses are important in Wyoming. CST: Do you think Wyoming will always have a place for epic mule deer and pronghorn migrations and large carnivores like grizzlies and wolves? Talbott: I pray that it does... We have a culture and tradition of wildlife in Wyoming like no place I’ve ever seen in my travels as a director or other places, and I hope we can conserve that and maintain those cultures and values for generations to come. CST: Does it worry you? Talbott: It doesn’t. I look at my kids. My kids love and appreciate wildlife nearly as much as I do. And I’m optimistic. Why do people come to Wyoming? They come for wide open spaces. They come here for wildlife, and they come for the people. As long as wildlife is a significant portion of that we will recognize it’s important and maintain those resources. CST: Do you think we’ll have to make hard choices? Talbott: I think we’ll have to make choices, I don’t know how difficult those choices are. I don’t see many things that are black and white. Look at grizzly bears… We can maintain a recovered grizzly bear population and have balance of agriculture and multiple use as well. CST: What is the biggest issue facing Wyoming wildlife moving forward for the next director? Talbott: Chronic wasting disease is going to be a huge challenge. It is becoming more and more of an issue not only in Wyoming but across this country, and the threats of the disease to wildlife populations, specifically deer, elk and moose are significant. Funding, we will need to be looking at funding sources. The department now is in a good financial position, but we look at the demands, migration corridors and highway crossing and the need for funding to protect and conserve our wildlife is significant… You’re looking at most of the burden on hunters and anglers. We need to look at how we are going to fund the agency into the future and maintain our viability. CST: What does your future look like? Talbott: When I took this job, the Wyoming statutes said the director of Wyoming Game and Fish will devote his entire time to the service of the agency, and I did that and it’s an honor and privilege to do that, and I want to take a break for a while. I want to spend some time enjoying the resources, the outdoors, the things that I used to spend a lot of time doing and simply have not had time to do. We’ll see what the future holds. I may become involved in conservation in a different vein, certainly there are opportunities out there to do that, but now I want to ride some horses and hunt some pheasants and elk and go fishing and enjoy the great outdoors of Wyoming for a while. CST: Is there anything else you’d like to add? Talbott: It’s been an honor and privilege to serve the people of Wyoming and wildlife resources in the state… The passion of the people in Wyoming for wildlife is encouraging, enlightening, contagious and those folks made a significant difference in our state and our wildlife. The employees of the agency, I have never been around and associated with a group of people who are as dedicated and professional as the employees of the Wyoming Game and Fish Department.